Come to our house during any holiday season and you won’t see a ton of decorations. I like to keep things simple. But, come to a holiday meal and it’s a completely different story. I LOVE setting a festive seasonal table. To me, creating a pretty table and sharing a meal with good friends and/or family can turn an average meal in to something spectacular! So here are some of my favorite ideas for my family’s upcoming corned beef and cabbage, potatoes and soda bread St. Paddy’s Day feast. Enjoy! 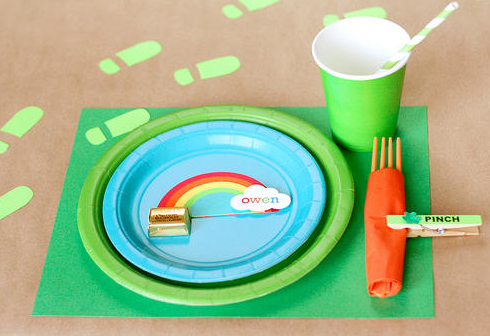 I love this cute (and so easy) table setting from Fiskars. I’m definitely going to do this for St. Paddy’s Day breakfast! 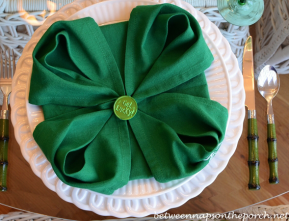 Between Naps on the Porch has an awesome tutorial for folding napkins in to lucky shamrocks! 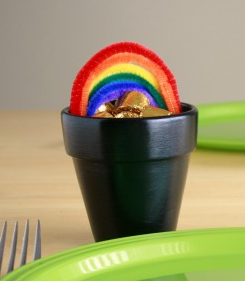 These mini pots of gold from Makes and Takes are an adorable addition to any St. Paddy’s Day table! 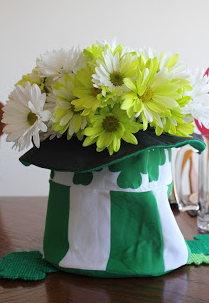 According to Kim’s Kandy kreations all you need for this fun centerpiece is a shamrock hat and some flowers from the grocery store! Brilliant.